Ricochet gets bullied. 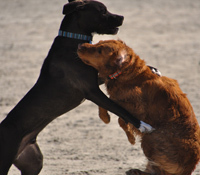 Yup, even dogs get bullied. But, ya know what? she's braver than the bullies! Brave enough to stay true to herself, and celebrate her individuality! She did it, and YOU will too! We support, and advocate for several bully prevention organizations, including Pacer's National Bullying Prevention Center. In fact, Ricochet's a Champion against bullying! In addition, she participated in Unity Day on Oct. 21st! Unity Day is when everyone can come together—in schools, communities, and online — and send one large ORANGE message of support, hope, and unity to show that we are united against bullying and united for kindness, acceptance and inclusion. • Wear ORANGE on October 21st! • Hold a Unity Day event at your school or workplace! Lady Gaga also has an organization called Born This Way Foundation. It's led by Lady Gaga & her mother, Cynthia, BTWF is buidling a brave new world where humanity is embraced, individuals are empowered, and intolerance is eliminated. 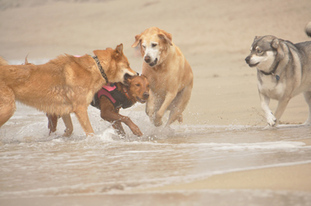 Please LIKE their Facebook page & tell them Surf dog Ricochet sent you! We also support other anti-bullying & suicide prevention organizations. 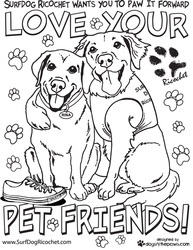 As a dog, Ricochet accepts, and loves others un-conditionally, and acts as a role model to humans. She promote kindness & treats everyone with respect. She loves everyone she comes in contact with. She's an advocate for anti-bullying, and being true to yourself. She supports, educates, empowers & inspires kids who get bullied, feel isolated, mis-understood, confused or any other uncomfortable feelings. She's just a soft, little dog, but she comforts kids with her voice and heart... offering compassion and support through unspoken words that only a dog can provide! She bonds with them instantly, and gives kids an outlet to feel connected, understood, and less isolated. She leads by example, and shows them how to make a difference in the world, embrace differences, celebrate individuality, help others, and turn negativity into something productive. 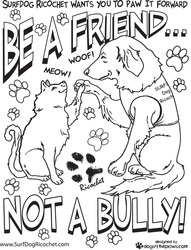 Tragically, many kids who bully are also mean and cruel to animals. 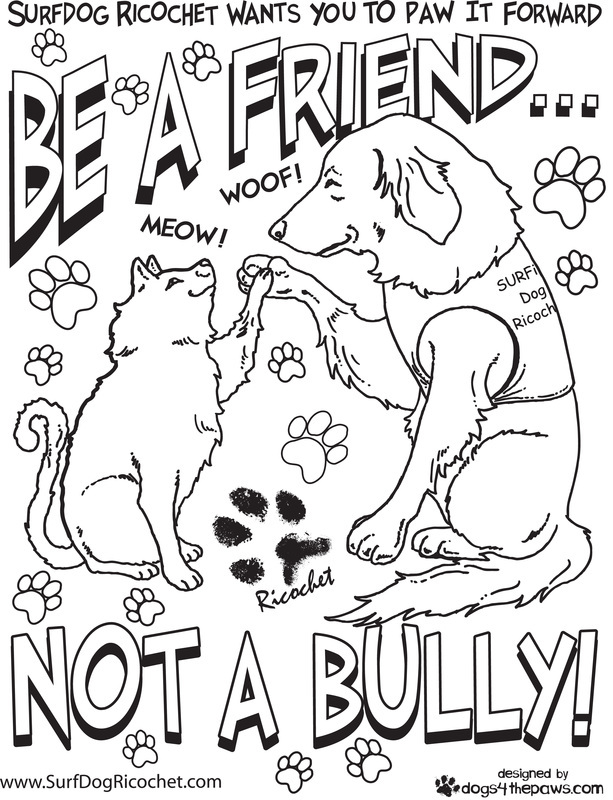 So, Ricochet's campaign is also an effort to reach kids before they mature into bullies... resulting in saving animals lives. 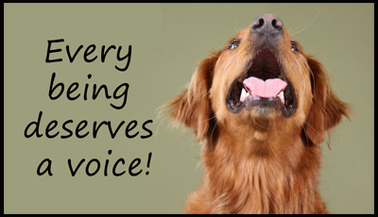 We believe every being deserves a voice. Each of us is an individual... we're on this planet for our own individual and unique purpose. Being different should be celebrated!! We celebrate who YOU truly are! We don't think others should have expectations of who we should be... we should all just be who we truly are! Nobody is better or worse than another... we're just different! Ricochet is different, and she celebrates it every day. 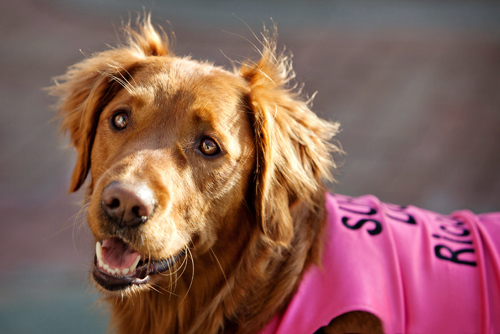 She's the only SURFice dog® in the world who surfs with special needs kids, people with disabilities, and wounded warriors as an assistive aid and intuitive muse. Her differences became her catalyst to help others in a way nobody ever has. 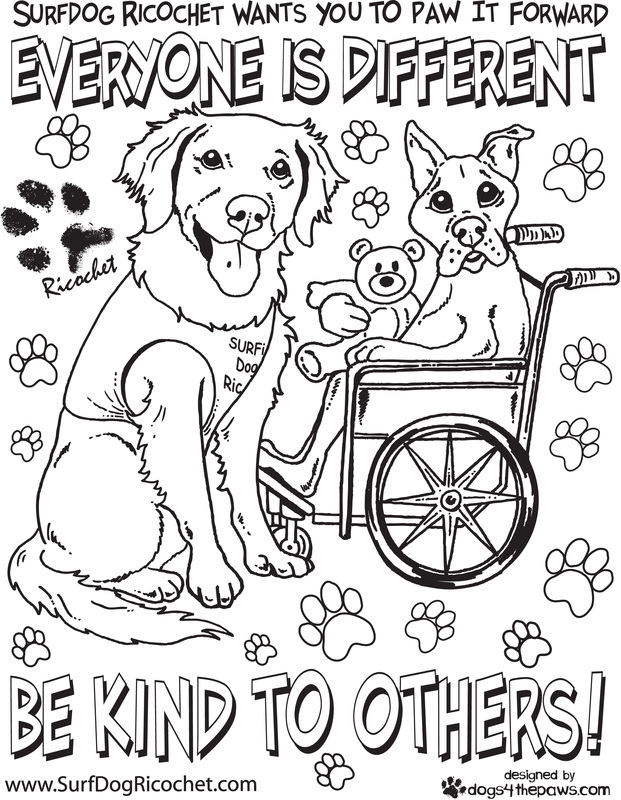 YOUR differences will do the same in your own way. We wanted Ricochet to be a service dog for a person with a disability. At first, the training was fun, but Ricochet got bored with it really quickly. We kept pushing her to be who we wanted, and she kept resisting. We struggled with each other for months... both of us frustrated. Then, one day Ricochet was at the beach with Patrick Ivison, an adaptive surfer who suffered a spinal cord injury that left him a quadriplegic. The plan was for them to surf side by side on their own separate boards. They did that a few times, but then Ricochet took a leap of faith... literally, and jumped on Patrick's board. She had to make a bold statement so we could finally hear what she had been trying to tell us all those months. It worked! At that very moment, we threw our expectations out the window, and honored what Ricochet wanted to do and be! Now Ricochet helps millions of people, instead of just the we had envisioned. She stayed true to herself, and so should YOU! She gets bullied by other dogs all the time because she's a soft, sensitive, submissive dog. But, despite that, she holds her head high, and continues to pursue her individual purpose. She likes being different! Check out this video of how Ricochet had expectations placed on her, got bullied, but came through it because she stayed true to herself. She found her voice, and YOU will too! 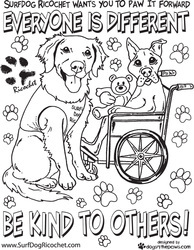 Please join us on Facebook where you will be accepted for who you are... welcomed into Ricochet's world with open paws! Or contact us via email at pawinspired at aol dot com. 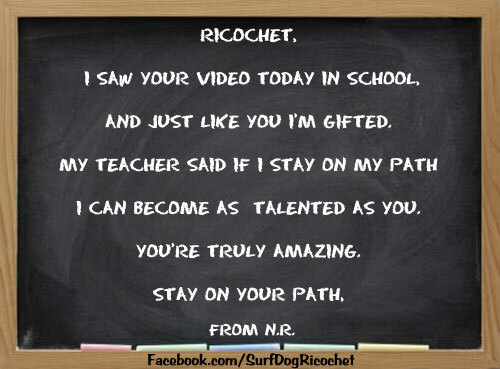 If you'd like Ricochet to "speak" at your school or other organization, please drop us an email. YOU'RE PAWMAZING, JUST THE WAY YOU ARE!!! 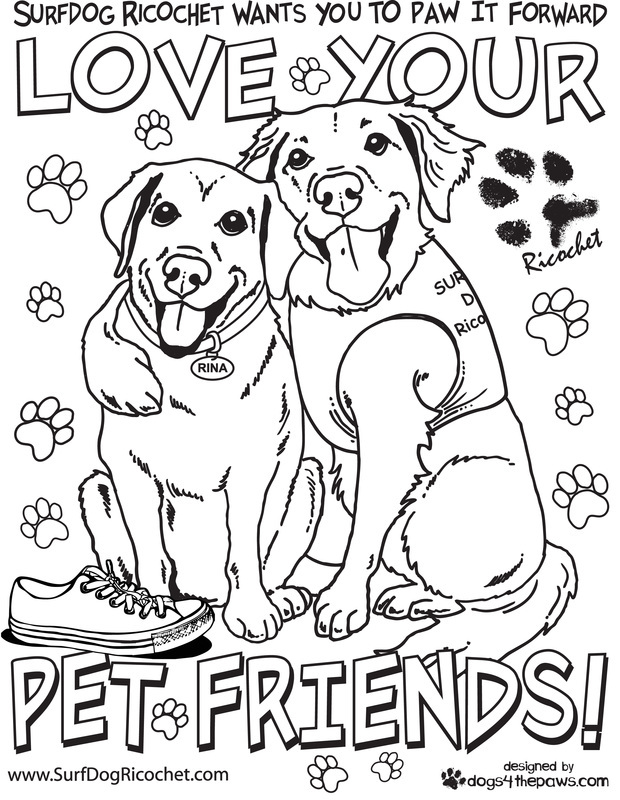 Click on the coloring pages below to make them bigger, then print them out, and color them!! Thanks to our good FURiends at Dogs 4 the Paws for making them.